We take a look at another batch of short films. 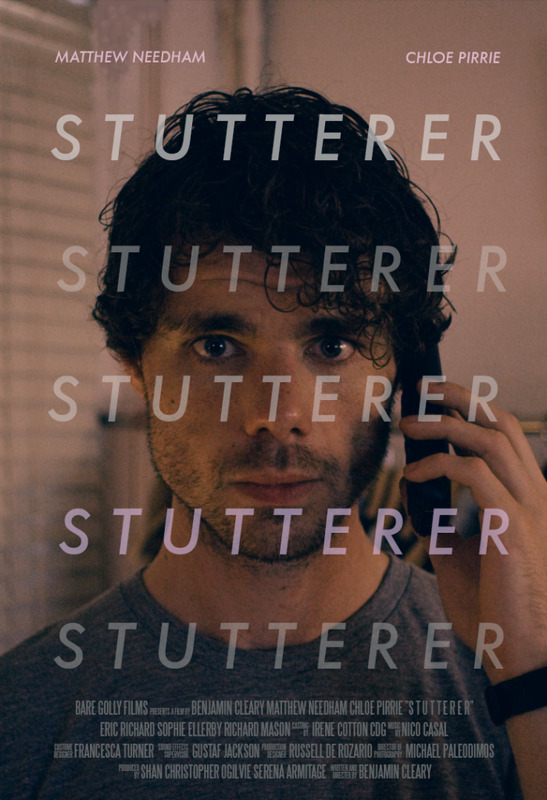 Benjamin Cleary’s Stutterer sees Matthew Needham as Greenwood, a mild mannered, romantic typographer who is beset with a debilitating speech impediment preventing him from the sort of social interaction that most of us take for granted. 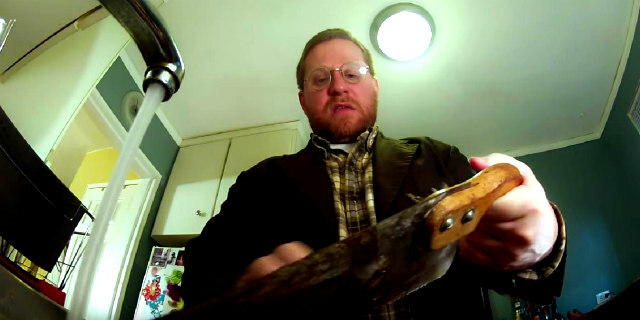 The film opens with a universally familiar scenario, as Greenwood impatiently waits in a telephone queue to sort out his broadband, and while this is a frustrating enough chore for those of us even with full command of language, it is doubly so for Greenwood, who is eventually unable to articulate his technical issues. The situation is manifest for Greenwood, a metaphor for his inability to speak with fluency; he is perpetually shut out, always on hold. 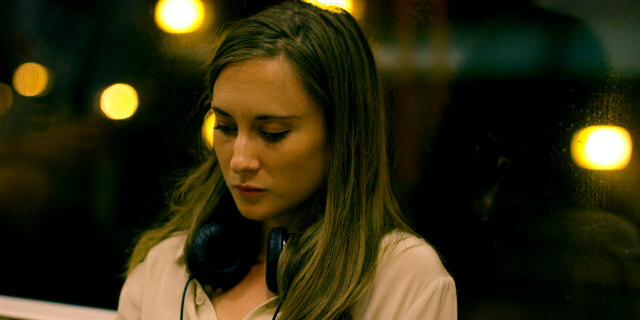 Part of this Oscar shortlisted film’s thematic grist serves to examine communication - Greenwood has continued a sweet, text only online relationship with Ellie (Chloe Pirrie) for six months, and his job ironically involves facilitating other people’s words - but Stutterer is most interested in giving a voice to minority experience, providing an insight into another’s unfamiliar struggle. And so, as the film progresses, we are privy to Greenwood’s inner voice, and his detailed, fantastical ‘snap judgements’ about strangers, people who he empathises with but could never dare to approach. Stutterer is a lovely film, made with compassion and a slick aesthetic. The end did slightly disappoint this viewer though; as a person beset with a nearly analogous ailment (crippling shyness), I wanted to tell Greenwood that, hey, it isn’t that bad son. You’re a good looking lad, with a great taste in reading material. Hang in there. People talk far too much, anyway. Alas, the end sees circumstance adapting to Greenwood’s debilitation, rather than him overcoming or accepting his impediment, which I felt he and the audience deserved to witness after the earlier, carefully crafted heartbreak of his everyday experiences. In Simple Mind, there are more subjective shenanigans, as beardy weirdo Bob (Timothy J. Cox) follows attractive Samantha (Kristi McCarson) to her apartment, some sort of gift for her gripped in his sweaty hands. Although the production values are cheap, the film making has true chops; the woozy camera and off kilter stylings exemplifying the fractured mental state of its protagonist, as we gradually discover that he is recounting his tale of terrible to-dos in a psychiatrist’s clinic. The suspense in Phil Newsome’s film is built especially well, right up to its twisted denouement. However, I take issue with the title. 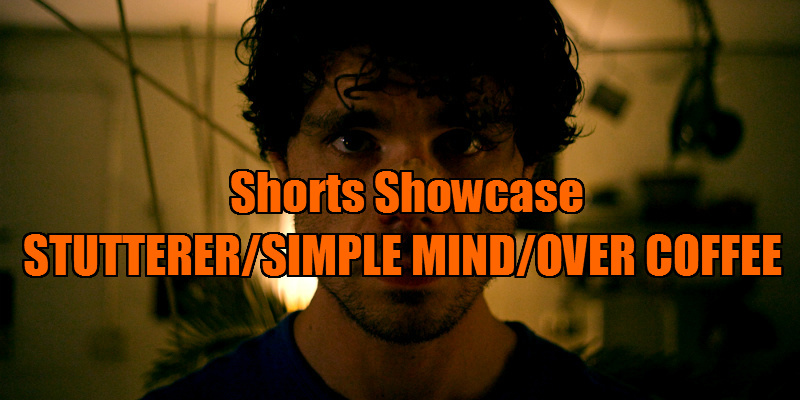 Like Stutterer, Simple Mind essays another perceived incapacitation, here portraying a mind that is not simple at all, but in fact complex and broken; a fragile mentality that perhaps shouldn’t be suggestively equated with evil. There are no mental issues in Sean Meehan’s Over Coffee, apart from, perhaps, the borderline egomania of the realtor office bods that romcom hero Andrew (Erik Potempa) finds himself lumbered with. It’s not all bad though, there’s the hot as espresso Carla (Jocelyn DeBoer) who works there, secretary to bullying manager (Timothy J. Cox) and skinny latte of Andrew’s eye. If only she could stop fussing around after her boss and notice our hero! The cartoony farce of Meehan’s film is handled deftly as Andrew agrees to fetch the Boss’s morning java in order to impress Carla, a quest that rivals the retrieval of a Peruvian golden idol for problems and pratfalls, with the film adopting a pleasingly cartoony feel as part of its peppy energy (there is a brassy soundtrack, and, wonderfully, when we overhear people on the other end of the phone it sounds like the blather when Charlie Brown’s teacher speaks). While it may be too silly for certain tastes, I found the application of action movie dynamics to mundane work chores good fun, and the petty work dynamics also ring amusingly true. Here are the Live Action Short films in contention for this year's Academy Awards.